Doubled sided baseplate for use with all major brick brands. Guaranteed. Or your money back!& ! Thick, premium silicone means no breakages and will last a lifetime! Categories: blocks Baseplates, Green Baseplates, Grey Baseplates, Pink Baseplates. This innovative brick building & blocks compatible baseplate is the perfect addition to any young (or old) builders collection. 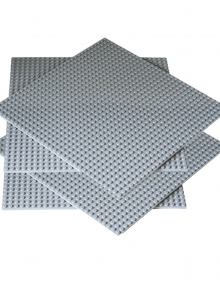 The large size means you can fit more building onto the plate, the mat has 100 x 38 brick studs or can be flipped over to build on 50 x 19 larger block studs. It comes in a classic green colour and is made from 100% premium silicone, which means your child will struggle to break this bad boy, even in the middle of a brick building inspired rage! We have been told by a few customers that the soft finish is great for helping to stimulate the senses of disabled children as opposed to the regular, more rigid plastic boards more commonly bought. Im sure there are more benefits, put simply, this thing rocks!!! This is in no doubt the best toy that my children have had in the last year they have played with it since it arrived. I especially like what it is made out off silicone this has helped one of our children greatly with his sensory issues I took it to his occupational therapy session the other day and they thought it was superb a fantastic idea and great design. We are foster carers for our local authority and it’s amazing how many children that we look after have sensory issues and a fear of using hard products this silicone baseplate helps them with their therapy you have two sides to the baseplate one for standard logo blocks the other for !. So this baseplate will do any child from the age of 2 to 94 being silicone it is flexible so there is no risk of it splitting which we have had before with more conventional logo base plates. As a carer I am always interested in new and ingenius ideas for my children and this certainly for filled my expectations I would highly recommend this to anybody a truly fantastic product made to the upmost highest quality. We’ve had lots of fun playing with this roll mat – we are huge brick building fans but often the children’s creative rainy afternoons are cut short because we either run out of base plates, or they aren’t big enough. This compatible mat is; exactly the size given and more than big enough for more than one child to play with. We received this at a timely moment, when the eldest had been set the homework task of building a mott and bailey. The mat was more than big enough for her constructing needs and can be rolled up not taking up much space once the castle walls fall. Branded brick building sticks perfectly to it, though it works best on a hardwood floor rather than soft carpet, and I’ve tried with blocks too – again it works. This is such a clever idea which passes the play test with flying colours. It is well designed and the strap for storage is good too. I would happily recommend this to others. A great toy. This is an excellent play accessory that should meet a need for many parents, carers and group childcare settings. This is a very well made and robust silicone mat that is double-sided and intended for use as a construction toy baseplate. One side -with large studs – is for use with the early years blocks-style bricks, suitable for toddlers and young children from eighteen months up to 5 years. The other side is for brick building, which in my experience has no upper age limit, although the brick building website suggests 12-16. The mat arrives rolled in a clear plastic tube, and rolls up neatly again for compact and easy storage – it comes supplied with its own green hook and loop (‘Velcro’-type) storage strap. The size (32″ x 12″, approx 80 x 30 cms) makes it particularly suitable for group childcare situations, or for playdates with friends; two (or more) children can take an end or side of the mat and work on their own space. Sharing resources like this is an excellent way for children to develop their social skills, particularly only children for whom sharing opportunities may be limited. 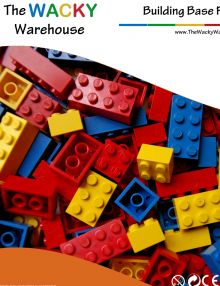 brick building, blocks and similar makes of construction bricks are near-iconic play items that develop a wide range of developmental skills in children. Fine motor skills (co-ordinating hands and fingers) are encouraged by manipulating the bricks, constructing models promotes spatial awareness. Playing with the small world sets once constructed develops language and imagination. For older children constructing the more advanced models introduces a range of engineering concepts; but above all, brick building is FUN and this unbreakable baseplate really adds to the enjoyment children will get from play. The standard rigid plastic baseplates do break if stepped on, and are definitely not kind to bare feet. This baseplate mat looks capable of being passed down through generations of children, the thick silicone is unbreakable and there is nothing to wear out. I suspect I will probably see this in my daughter’s kitchen, bathroom or at the patio step in a few years time when my grandson has eventually outgrown it. A really good investment in helping to extend play value for construction toys and definitely recommended. I wish this had been around when I was a registered childminder, as a tutor in home based childcare I have no hesitation in recommending it. I was fortunate enough to receive a sample to review without cost; this is my honest and unbiased opinion. my 2 sons love this toy! Its big enough for them to share, so arguments are kept to a minimum and it encourages them to share more A+ from me! 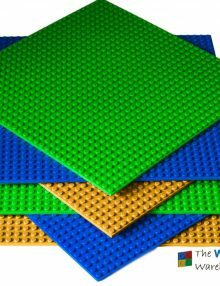 This mat is fantastic made from silicone in dark green ideal for brick building one side and blocks the other side so ideal for if you have two children that are in to both the mat can just be flipped over for which ever is in use at the time. The mat can be rolled up again using the velcro strap round the middle so can be taken anywhere at ease ideal for taking to grandmas for a sleepover. This is ideal for any setting as we all know kids love both brick building and blocks even big kids my husband is for ever building some design or other. For all orders in the UK, we will aim to ship your order out the next day, royal mail 2nd class free of charge, just for being awesome and ordering from us. For orders in the EU, we offer royal mail delivery estimated 5-7 days for a charge of £9.80 - we cannot offer next day delivery to the EU yet. If you are outside the EU, please contact us and we can quote you a price, it will probably be expensive though. Perfect for large scenes & tables/walls. Boards are compatible with all major brick brands. Guaranteed. Or your money back!& !